With our teamwork function you can work on newsletters in a team. On the right side of the screen fields appear in which comments and suggestions for improvements can be added. The creator of the newsletter receives an email about every comment that is added and can write back with any questions in the comment column. This means that you can work together on your email campaign with ease and improve your workflow. If all involved are satisfied with the result then the manager or management team can approve and enable the newsletter dispatch. 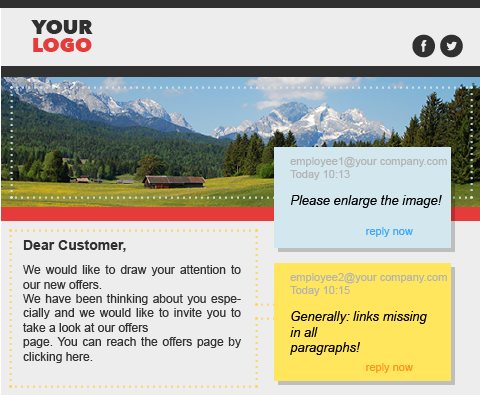 The creator receives the approval by email and can send the newsletter.